Google Thewallinna and other creatures: Louis or not Louis? 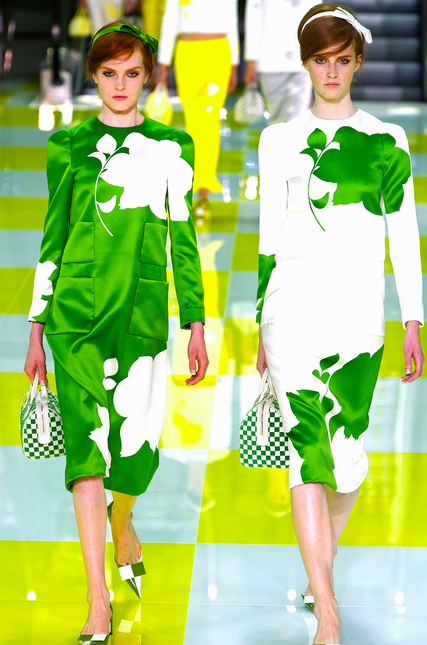 Louis Vuitton Spring RTW 2013 collection did not leave me indifferent to its subtle geometric shapes and bursts of color. But for me, the yellow stands out more than any other color. So when I saw this cute yellow & white check fabric in Fabrics&Fabrics in NY last April, I did not hesitate to purchase 1.5 metres.! The sales assistant claimed that the fabric was genuine Luis Vuitton but I did not know whether to believe him or not. The only thing I knew was that I badly wanted to make a simple shift dress from it! 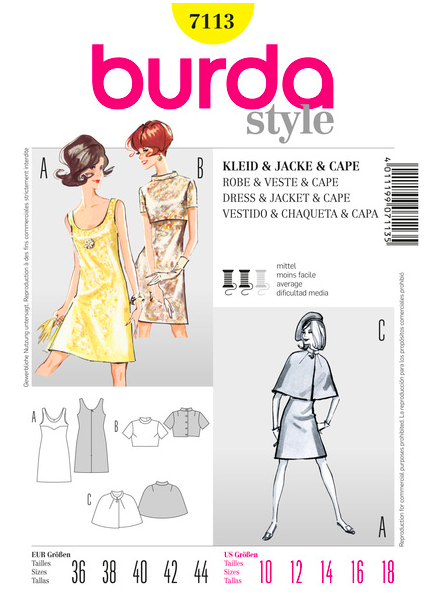 The inspiration came from a Burda Style vintage pattern: B71113. Although I tried to use the pattern and later alter it, after the third muslin I still could not achieve a perfect fit on the back, I gave up and drafted the same pattern using my own dimensions. If you try to imagine a tubular piece of fabric put on this figure type, the bottom pulls it away from the body on the lower back and, instead of nicely flowing down, the fabric would gather on the bum. If I had bigger bust, it would pull the fabric to the front upper area. This tube would be all wrinkled and shapeless. Same happens with a garment with no seams or only back seams. A person with swayback and rounded shoulders requires several alterations to the back. On my humble opinion, the easiest alteration is to add the center back zipper and adjust the CB curve according to your body measurements. 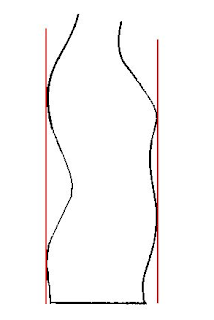 But if a person has a round back like mine, the pattern needs more tweaking to make the back look nice. FYI, more detailed explanations of different types of sway back alterations are described by Sherry. The problem with a round back is that the fabric on the shoulder area tends to pucker because of my popped-out shoulder blades, which I call "wings". (I like the idea of giving positive names to unfavoured body parts). 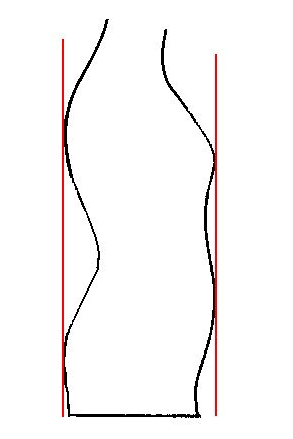 After brainstorming with my teacher on how to make the same design work for my back, we decided to integrate a seam cutting the back into two parts and mirroring the front panel (the new seam is marked in red on the technical drawing below). This tiny modification allowed me to adapt the top back part to my rounded shoulders without distorting the bottom. Fit-wise, the result is quite satisfactory. The top part of the dress fits tightly to the shoulder area and my "wings" don't look too obvious. You can see on the photo that the fabric hugs nicely around the shoulder blades. Skill-wise, I still have some way to go. 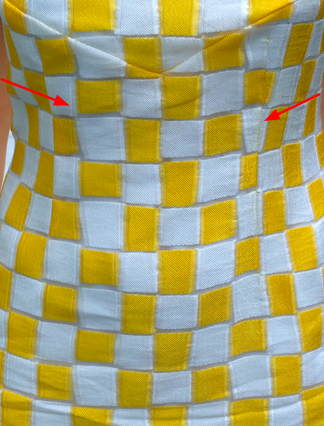 While I managed to match checks along the zipper line on the top piece, the bottom could have been done much better. I got so carried away with my little victory in matching the other seams that I failed with the bottom back part, which I sewed last ﴾͡๏̯͡๏﴿. Nobody's perfect, said my inner voice. Mental note: next time stay focused and double check the matching! What I am proud of are the matched curve and front darts. I've got a long way to go to learn all the tricks in this area and you can clearly see that not all the checks on the front match. Besides, I did not do enough pressing on the front curve and that's why the seam jumps out at you. Design-wise, the dress is fully lined with white polyester which I sewed entirely by hand. To reinforce the armscye and neckline areas I sewed in strips of silk organza. At this point, I add them automatically. The hand-sewn lapped zipper is another design detail which I am absolutely in love with. I would add them to any garment! 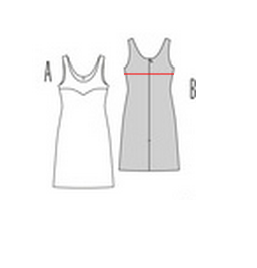 The final touch to the dress construction was understitching the neckline to prevent the lining from popping out. What would be different next time? The fabric! Wow this is amazing. The first pic of your dress looks like a fairly straightforward design like the Louis one, but it's clear you put a lot of effort into getting that effortless look. 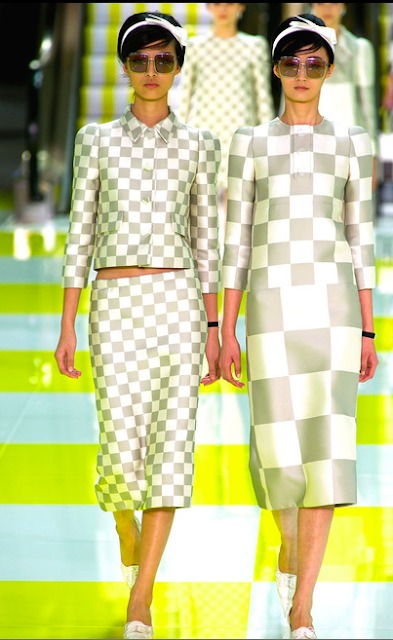 The fit looks great, and the pattern matching makes all your seams virtually invisible! hehe thank you ^.^ I think that for the second version I will use the factory print panel fabric! P.S. Still unable to leave comments on your blog. Annoyed :( The wedding dress is very elegant! I can only imagine it with painted flowers! Does the upper front have a separate yoke section? I thought for a second that you had your bust darts curving down and meeting in the middle. Either way it looks cool! Inna, it looks great on you! I love it! You made a great work, it has to be hard work with all these rectangles! The original design of the front consists of yoke and a skirt, sort of Empire style. It was not easy :( But, I guess, this is just a question of practice! Wow, your own tailored LV dress! The fit looks awesome from here, and the fabric is amazing... LOVE it! Great dress-- it looks awesome on you! It's such a fun, bright look! You are too unfair toward yourself and too nice towards me! This year I am obsesses with yellow! I love it! 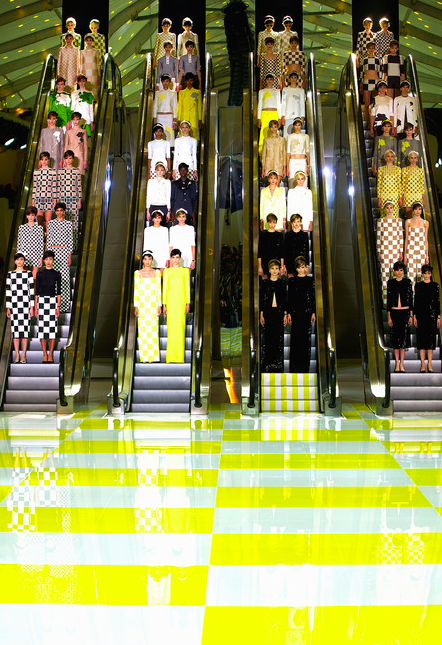 That Vuitton collection was amazing and so classic I wanted to copy every dress. But I haven't found the perfect fabric like you. 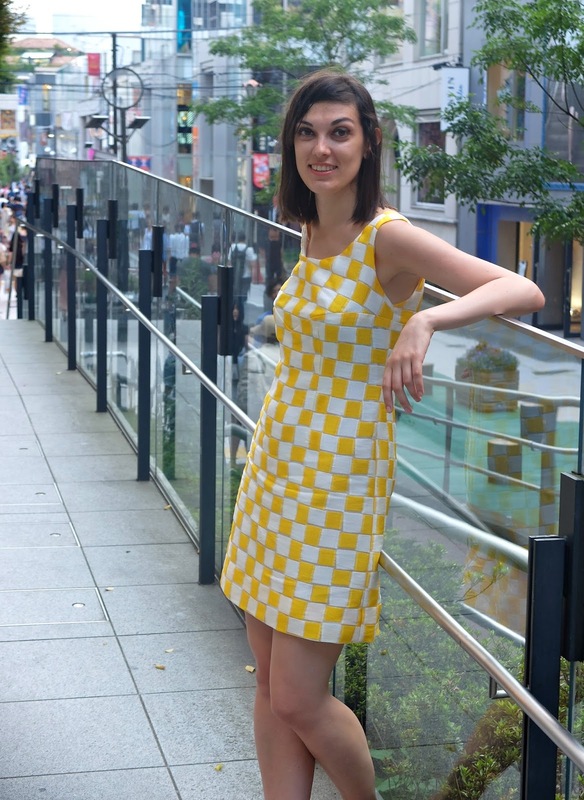 That yellow look amazing on you and the simple shift shape is so chic! I wish I could find some fabric with big squares! For me, it was the best Marc Jacob's collection ever! Love this dress too and yellow really suits you! 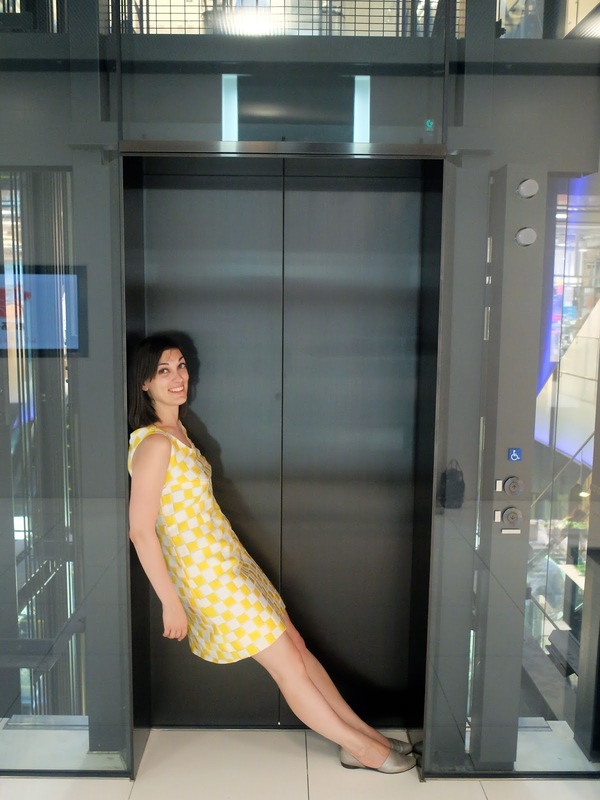 Hi, like your blog...I also have same posture as you and find it impossible to fix, so any tips looked forward to!! Your dress is lovely - a great take on the LV collection. Nice work! GAK! You are adorable in this dress! 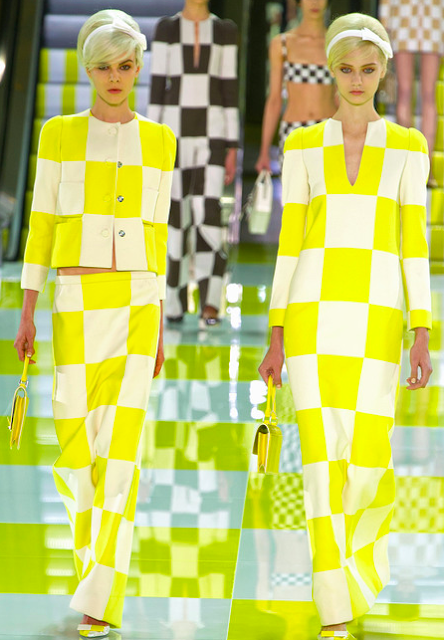 I love the check, and the vibrancy of the yellow and white! And I love the runway show you shared with us too! Thank you! This show was one of my favourite ever! I wish I could find more similar fabrics "SIGH"